Something most of us grew up with was salmon croquettes. Pan fried salmon, vegetable, herb and breadcrumb golden goodness with a big glob of tartar sauce to smear on them. It was simple goodness way back when salmon was much less than today’s $5.00 a can! Several years ago, I took friends to a very nice, but sadly now defunct, restaurant, to celebrate their engagement. They are good, sweet people from a small Texas town that boasts all of two cafes. He gets to travel in his job and has been to some nice places. Her job keeps her pretty much in their town and her dining experiences are limited. It was my pleasure to provide a big city-treat. I suggested a grilled salmon dish with a pineapple and jalapeño sauce. The young lady was impressed with the restaurant and the menu. She enjoyed the salmon, but the sauce was a little spicy for her. She finally said, “My, that was good! I ain’t never had salmon excep’ in croquettes before.” I sometimes use those very words when enjoying new salmon recipes at home or on the town. It preserves a good memory of a very nice evening reminds me how it was growing up in a small town. I thought of them and that night when I ran across a recipe for salmon cakes and arugula salad. It sounded good and decided to give it a try. No celery and chopped onion and bread crumbs croquettes in this one. And no iceberg lettuce and tomato salad. These cakes had gone to town! Salmon cakes and arugula salad with yogurt dill sauce, its like a croquette gone to town. Toss arugula with remaining 1 tablespoon oil and 1 tablespoon lemon juice, and salt and pepper. 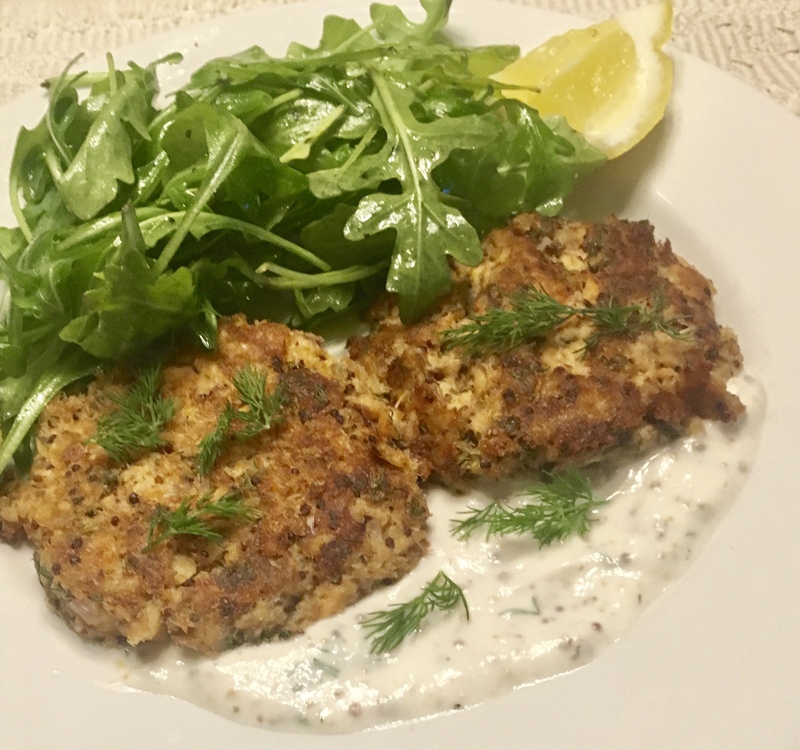 Serve salmon cakes with yogurt sauce, arugula salad and lemon wedges.Note: I used a 14 ounce can of salmon to make four cakes. I reduced the ingredients for the cakes by an eyeballed 15 – 20% and they turned out fine. The lenten season is over. My favorite seasonal bread pudding, capirotada, is off the menu until next year in local Mexican restaurants. Fortunately, many offer Caldo de Pescado, (fish soup) year ’round so all is not lost. Last night was chilly and called for a Mexican style fish soup. I didn’t want to go out to a restaurant. How difficult could it be, I figured, so it was a quick trip to the store and back to the kitchen to play with my food! 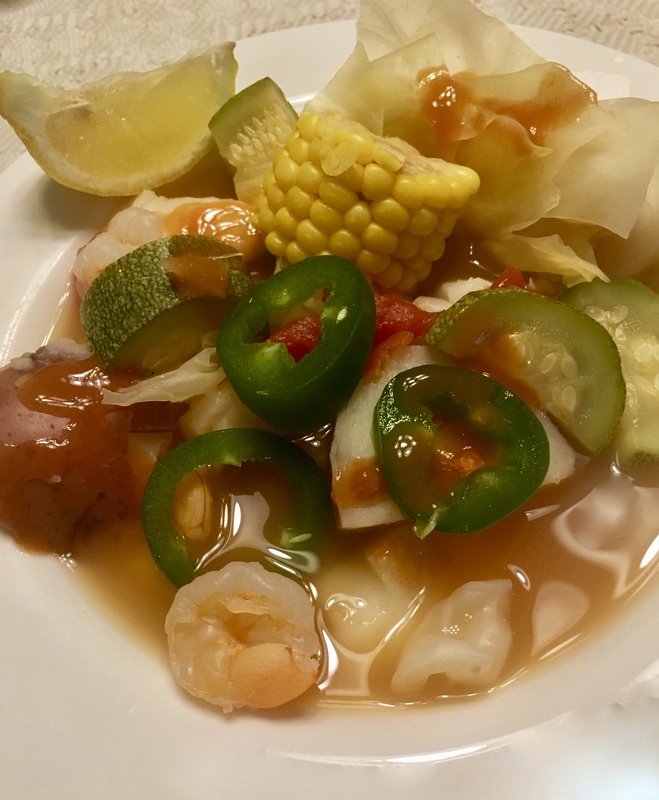 Jim’s fish soup with cod, shrimp, vegetables, jalapeños and hot sauce. Just right for a cool and windy evening. For starters, there are plastic packets of ready cut vegetables for caldo in most of our groceries. I picked up one that had a wedge of cabbage, two carrots, two small potatoes, a shucked ear of corn, a small onion, a Mexican gray squash, half a turnip, a lemon and two jalapeños. I picked up another ear of corn and two small potatoes to be sure there was enough. Good thing I did; the corn in the package had started to dry up and one potato was past its prime. That spur of the moment decision saved the day. Better than Bullion cooking bases are a staple in my pantry and refrigerator. They are thick pastes reduced from meats and vegetables. While salty, they are not as salty as bullion cubes and ever so much better. They come as beef, chicken, vegetable and fish bases and are the company is starting to offer lower sodium versions. I used a good size dutch oven about 3/4 full of water and roughly three tables spoons of fish base for starters. That’s easier than the tradition Mexican recipes calling for boiling grouper heads and bones to make a broth. Besides, being from El Paso, it wouldn’t know a grouper if I met one..
One Mexican thing was boiling the potatoes and carrots separately because they are starchy and can cloud the water. The other vegetables went into the dutch oven for about 20 minutes. As the veggies were got tender, I added a pound of bite size chunks pacific cod for an additional 10 minutes. Pacific cod is firm yet tender and not too fishy tasting. It is still reasonably priced. Next came a half pound of raw shrimp peeled and tails clipped before going into the soup. A can of diced tomatoes (non-traditional ingredient) rounded out the flavors of the broth. Just before serving, the potatoes and carrots went into the big pot and it was all stirred together. On the side, lemon wedges, a seeded and sliced jalapeño and a bottle of Franks Red Hot Sauce stood by to liven things up. This first-time fish soup goes on the “Let’s have it again” list. 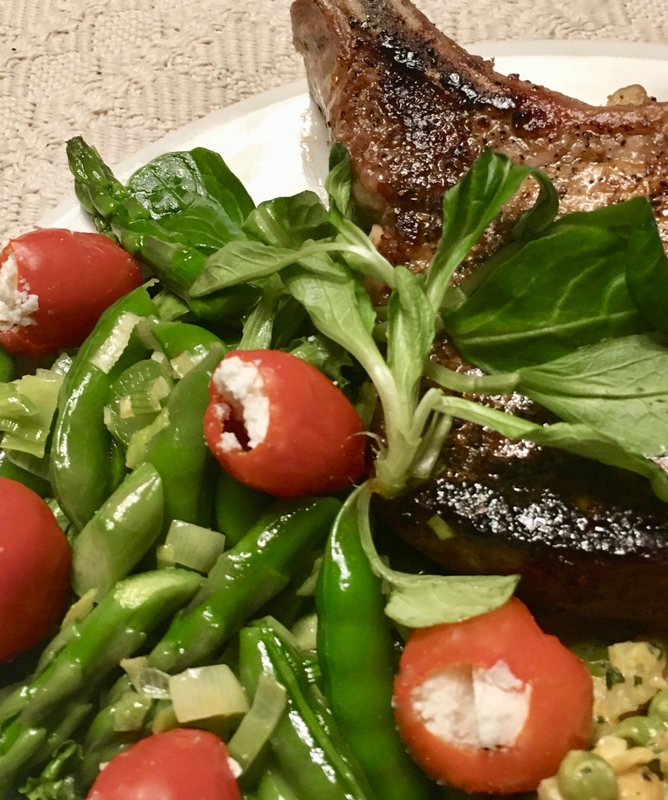 Spring Salad of snap peas, asparagus and leeks on a bed of leaf lettuce and mâche with a lemon vinaigrette and a garnish of pepadew peppers stuffed with ricotta salt. In this photo, a rosette of mâche rests on the edge of an oven roasted pork chop. While we were at a meeting the other day, sweet Alice Parra slipped me a generous bag of snap peas from her garden. They were beautiful. At every traffic light on the way home, I pulled the strings off a couple and munched on them raw. I couldn’t wait to get them into the kitchen. I had been inspired by a recipe for chicken thighs braised with peas, asparagus and leeks. It sounded good, but I thought the combination would be better as part of a salad. Those snap peas needed to be bright and crisp instead of braised. So, once more, I had to play with my food. 1/2 lb. or so fresh snap peas, string removed and left in the pod. Sauté leeks on medium heat until tender. Remove from heat and set aside. Trim and slice asparagus at an angle, string the peas. Sauté asparagus and peas in the leek pan until crisp/tender and bright green. Plunge into a bowl of ice water and stir to stop cooking, drain and set aside. Stuff pepadew peppers with ricotta salt. They are so good, that you must let your conscience be your guide about how many to make. Was and dry lettuce and mâche, tear lettuce into bite sized pieces. Pinch root tips off mâche rosettes. Zest lemon, halve and squeeze juice of 1/2 lemon onto greens, place and juice of remaining lemon half in a bowl with 2 tbsp olive oil. Whisk until emulsified. Season with a little salt and pepper. Toss greens with lemon vinaigrette. Add leeks, asparagus and peas to greens and toss lightly to mix. Plate the salad and place a few stuffed peppers on top for color and garnish. 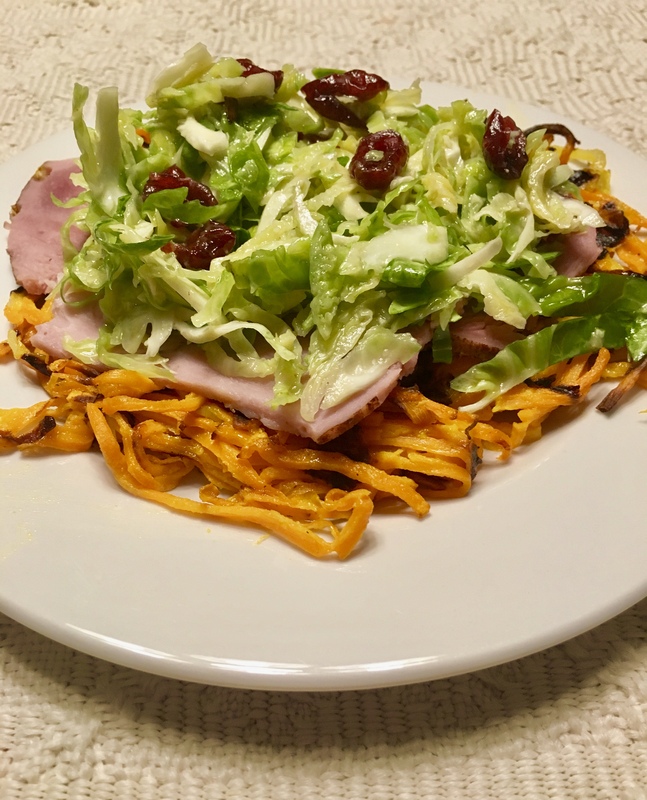 I served this salad with a pork chop and a delicate salad of curried chickpeas with minced vegetables.